As the founder and manager of a marketing group that utilizes article marketing (content marketing), I've noticed that some writers don't know the proper formatting of an article. Along with this, there are even more who don't know how to use keywords and tags for blog post search engine optimization. It's important for any writer writing articles to increase visibility, expert status, and readership to know how to use their content effectively. That's where this article comes in. Creating content is an essential marketing strategy. It establishes you as an authority in your niche or on a particular topic, increases your visibility and readership, and brings traffic to your site. It also broadens your marketing reach, which helps bring more traffic to your site. Bringing traffic to your site to sign up for your mailing list is the real goal to just about all marketing strategies, even more so than selling a product. The reason for this is that a person on your mailing list gives you the opportunity to build a relationship and promote various products and services – it provides the basis for multiple sales. A non-subscriber, a one-time visitor/buyer is just that: a one-time deal. If you notice, Herring says, “when done correctly.” Part of doing it ‘correctly’ is to have your article content properly formatted. Your title should be reflective of the article content and the first letter of each word should be capitalized. The same rules hold true for your subtitle. WANT TO BRING YOUR WRITING AND BLOGGING UP A NOTCH? 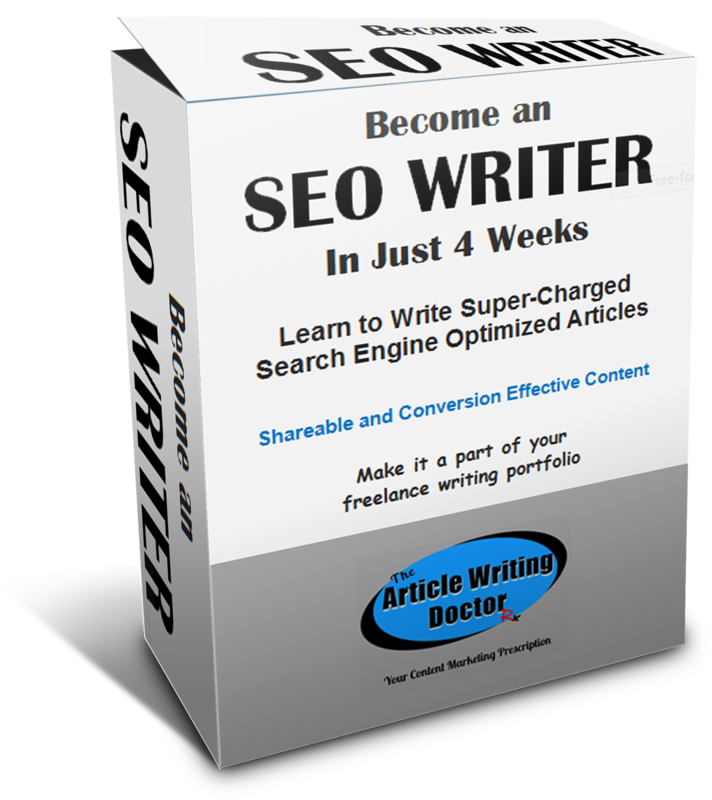 BECOME AN SEO (CONTENT) WRITER IN JUST 4 WEEKS will teach you to write super-charged articles and content that will be 'reader' and SEO friendly, shareable, engaging, and will increase conversion. Make it a money-making part of your freelance writer’s portfolio. The class will also show you how to find prospects and work. It's interactive, in-depth, and through WOW! Women on Writing. Check it out today. Just click on the link above for the details. Outsourcing Articles as Part of Your Marketing Strategy – Is It Right For You? Right, understood this so far. I shall be following next week thanks Karen. I really need to know this. Annie, I'm so glad you found this helpful! It's really important for article marketing. Hi, Karen. Great information. Taking notes. Looking forward to next weeks post on the subject. Susanne, thanks for stopping by. Article marketing is a great way to create visibility - formatting your content properly is part of effective writing. Annie, I'm thrilled you are using the article for tips! So glad I dropped by, Karen, you are one of those rare combinations of writer and IT Gal Personified! Thanks you for this. Great article info Karen, thanks. Kathy, Glad you found it informative. Shirley, I forgot to mention that Part 2 is us. The link is at the bottom of the article.